Club director for service projects, Kevin Roberts, in making the presentation said that the Club was pleased to be in a position to assist many local groups again this year. In the case of Yooralla, he said that the funds would be used to purchase furniture for the new training room, and for floor covering and improvements in the kitchen. Practical assistance also had been provided by way of reconstruction of a raised garden bed. President Ian Bennett said that, in settling on the Club’s substantial list of end of financial year disbursements, the guiding principle had been the desire to assist as many community groups as possible, with benefit to the maximum number of people. He said that these donations were made possible by the Club’s major fund-raising projects, the Motorfest, the Swap Meet and the monthly Drouin markets. 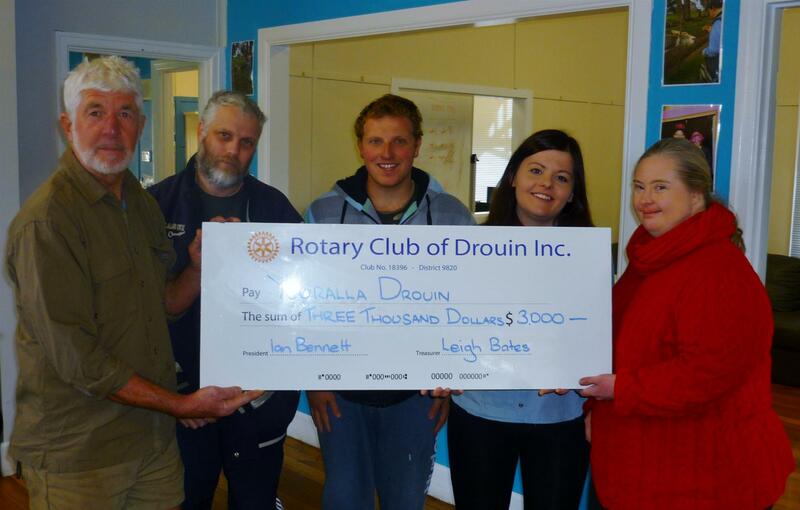 Yooralla Drouin Hub Manager, Shannon Fischer (second from right) receiving the cheque from Kevin Roberts (left), with Stephen Miller, Gavin Sayers and Fran Daniels.